Results: Depicting a catalyst’s behavior in the real world just got a lot easier, thanks to scientists in the Institute for Integrated Catalysis (IIC) at Pacific Northwest National Laboratory. They used complex calculations to describe the surface temperature of a reaction based on the thickness of the catalyst, the heat transferred in the reaction, and the transport of the reactant. Their research provides an accurate and reliable computational model of conditions found in the real world. These multi-scale simulations can predict the limitations imposed by environmental variables in real-world situations, improving catalysts for many important practical applications. Why It Matters: In industry, cost is always a primary consideration. Technologies such as oil refining, pharmaceutical manufacturing, and production and storage of energy are very expensive enterprises. Catalysts are used to speed up and to efficiently provide the desirable reaction results for those industrial processes. Much of the research done in the catalysis arena is focused on making the catalyst more selective for the desired product, and reducing the amount of energy required for the chemical reaction. In this new work, researchers have used computational methods to extend the reaction modeling from the microscopic scale of the chemical reactions, to the macro-scale level of the overall catalytic process. By moving closer to real-world operational conditions, this research supports the need to design better catalysts and optimize the reaction conditions in catalytic reactors. Methods: Ruthenium dioxide (RuO2) has been widely investigated for many important industrial reactions. Previous modeling of RuO2 reactions has focused on the elementary surface reactions at the microscopic scale. With these models, scientists can predict the catalytic kinetics under constant reaction conditions. However, in a real chemical reactor, the reaction conditions such as temperature and pressure can often change as the catalytic reactions proceed. For example, accounting for possible changes in surface temperature of the reaction and the mass transfer of the gas reactant through and over the catalyst have not been considered. And until now, these factors have been difficult to account for due the different time and length scales of the computational techniques. 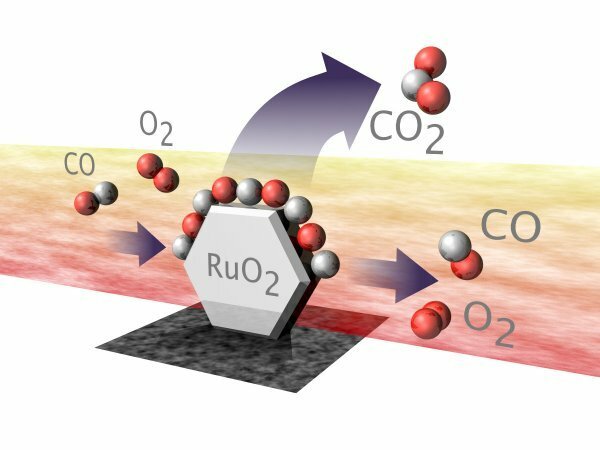 Using carbon monoxide oxidation on the RuO2 catalyst as an example, IIC scientists were able to demonstrate that the macroscopic reaction kinetics of the oxidation processes are dramatically affected by catalyst size and surrounding reaction environments. Their catalytic reaction model showed that both heat and mass transfer can change the reaction dramatically. If the reaction heat is not effectively removed, the catalyst itself will overheat and deactivate. Such high temperatures can lead to the growth in size of the catalyst particles, reducing the number of catalytically active sites where the chemical reactions take place. If very high temperatures occur during overheating, evaporation and loss of the catalyst can result. The thickness of the catalyst on the support has a significant effect on the ability of catalyst to withstand changes in the reaction environment. At the nanometer size, the catalyst reaction may proceed too quickly and then easily deactivate because the heat generated by the reaction cannot be effectively removed. The models show that by increasing the thickness of the catalyst, the reaction heat generation and removal are often less of a problem. In this study, the researchers also considered mass transport of the gas reactants to, from, and through the catalytic reaction zone. To keep the reaction going, the reactant molecules must move to the surface of the catalyst for adsorption, and the product molecules also need to quickly leave the same region after desorbing from the catalyst surface. These movements of gas-phase reactants and products can also provide effective ways to add or remove heat from the catalyst surface. By understanding and effectively managing this mass transport, catalyst activity, selectivity, and durability can be optimized. With this research, the IIC scientists at PNNL have developed an accurate and reliable computational model for in-reactor catalytic processes. They demonstrated the necessity to include heat and mass transfer in the surrounding reaction environment and their effects on the reaction kinetics. What’s Next: The researchers plan to extend the current multi-scale model under reactive flow conditions. 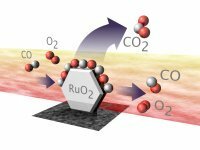 Extending the model will allow scientists to determine the effects of fluid flow and gas-phase reactions on the in-reactor catalytic performance. Acknowledgments: This research was funded by the U.S. Department of Energy Office of Advanced Scientific Computing Research and the Laboratory Directed Research and Development project at PNNL, and was performed by Donghai Mei and Guang Lin of Pacific Northwest National Laboratory. Research used the supercomputing resources at the Environmental Molecular Sciences Laboratory (EMSL), a national scientific user facility at PNNL, and the National Energy Research Scientific Computing Center at Lawrence Berkeley National Laboratory.